Truly a medicine for body and soul, one of cannabis's greatest gifts is its remarkable potential for spiritual healing and awakening. 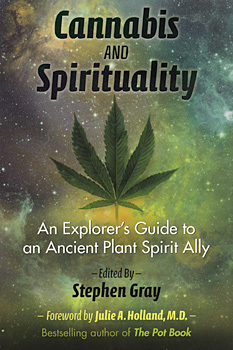 In this authoritative guide, editor Stephen Gray and 17 other influential voices of the modern cannabis movement explore the spiritual benefits of cannabis and offer guidance on how to interact with the intelligence of this plant ally, a companion and supporter of humanity for millennia. Exploring cannabis spirituality in practice, Gray's chapters examine dosage, strains, and methods of intake; the use of cannabis to open the creative channels; how to conduct group ceremonies with cannabis; and cautions and counterindications for cannabis use. We hear from Chris Bennett on the religious and ritual use of cannabis from pre-biblical times to the present, Joan Bello on marijuana and the body-mind connection, Dee Dussault on ganja yoga, Kathleen Harrison on humanity's co-evolution with cannabis, and cannabis shaman Hamilton Souther on working with the spirit of cannabis. The contributors explore the spiritual future of this plant ally as well as the ritual use of cannabis by the Rastafarians of Jamaica and the Sadhus of India. The chapters from Brazilian ayahuasca shaman Mariano da Silva and ayahuasca apprentice Francisco present wisdom on comingling the sacramental medicines of cannabis and ayahuasca. Revealing the potential of "the people's plant" to enhance a wide range of spiritual practices, such as meditation, yoga, chanting, visualization, shamanism, spirit work, and explorations with other entheogens, this guide shows how cannabis is an effective ally on the awakening journey, unlocking the receptive energy in us all and helping us to feel connected to nature, to each other, and to ourselves. "WARNING: Reading this book will forever change your opinion of cannabis and your relationship with it! . . . wonderful, often lyrical, immensely practical." "The contributors to this volume point to the ancient pedigree of cannabis as a plant substance that assists the work of shamans and spiritual healers and deepends our connection with the higher dimensions of reality and their creative expressions. This is an excellent addition to the literature on the many positive aspects of this sacred medicien plant. Stephen Gray is a teacher and writer on spiritual subjects and sacramental medicines. He has worked extensively with Tibetan Buddhism, the Native American Church, and with entheogenic medicines. The author of Returning to Sacred World: A Spiritual Toolkit for the Emerging Reality, he is also a conference and workshop organizer, leader, and spearer, as well as a part-time photographer and music composer under the artist name Keary. He lives in Vancouver, British Columbia.